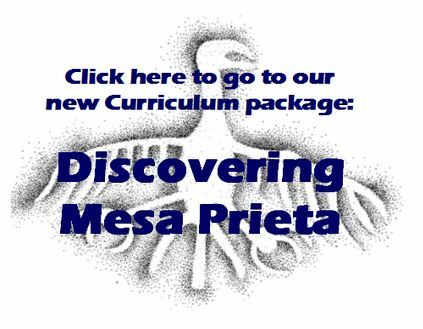 The 4th - 7th Grade Curriculum “Discovering Mesa Prieta” is an award-winning interactive STEM-based (science, technology, engineering, math) curriculum that has been used in some 20 Pueblo and community schools since 2003. 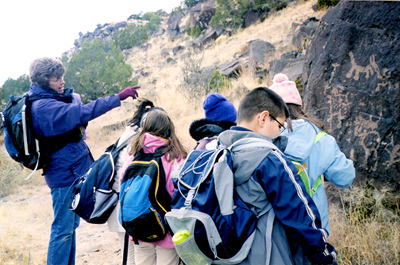 Each year, more than 200 children are taught heritage ethics and stewardship and visit the petroglyphs of the Wells Petroglyph Preserve on Mesa Prieta. Perhaps another 200 teachers, principals, parents and tribal members gain an understanding of the mesa's significance. Originally, the content and teaching resources focused almost completely on Ancestral Pueblo petroglyphs and history. In 2008, the 4th Grade Curriculum “Discovering Mesa Prieta: The Petroglyphs of Northern New Mexico and the People Who Made Them” was awarded the First Annual Education Award by the American Rock Art Research Association. 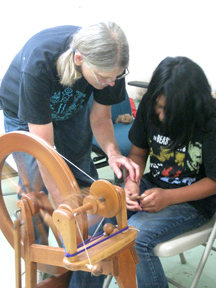 In 2006, the curriculum was honored with the Piñon Award for Educational Service by the Santa Fe Community Foundation. 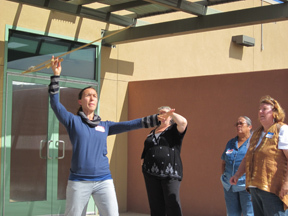 A teacher demonstrates throwing the atlatl, a pre-historic tool used prior to the evolution of a bow and arrow. of technology in the lassroom; increasing the reach of the curriculum in the state. The inclusion of Hispano history and culture content in the curriculum will confirm its importance for hundreds of school children, many of whose families have deep roots reaching back to the days of the Conquistadors. The celebration of Hispano culture in the classroom will promote respect for and connection to the Historic period heritage of Mesa Prieta. Content exploring the impact long ago of the sudden arrival of new people with a new language, strange animals, different religious symbols and the ways in which this heritage thrives today in New Mexico will resonate with a large demographic sector that has up to now had minimal recognition in the curriculum. yarn in a traditional manner. time they experienced hiking outdoors. 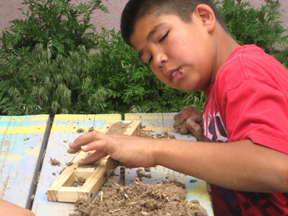 A student is making miniature adobe bricks using a traditional mold replica and mixture of mud and straw. The importance of language, church and family, animal husbandry, settlement pattern, farming, acequias and iconography - all featured on the mesa - can be explored through interactive activities aligned with New Mexico Common Core Standards: interviewing family members, playing with water and gravity, dressing up in costume, local names for Mesa Prieta landforms, sprouting heritage seeds, mapping a neighborhood or a family name found on a basalt boulder, categorizing crosses. A curriculum website offers NM teachers easy access and download. It features an online area where children, teachers and families can tell their own stories in words and pictures. Such cultural learning paired with these activities gives Hispano students a sense of deep history and themselves as part of the unique heritage represented on the mesa. The curriculum consists of twelve units taught in the classroom followed by a tour on the Wells Petroglyph Preserve on Mesa Prieta. MPPP provides the curriculum content, learning material trunks, and now access to the new website - all free. at the Northern Rio Grande Heritage Center.